This article might contain spoilers for people who didn't see the film yet. 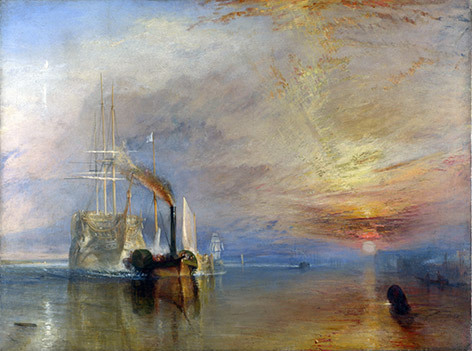 The painting most promintenly shown and talked about is The Fighting Temeraire tugged to her last Berth to be broken up, 1838, by English artist J.M.W. Turner. This oil painting painting is one of the most famous works by Turner. It depicts one of the last second-rate ships of the line which played a distinguished role in the Battle of Trafalgar in 1805, the 98-gun ship HMS Temeraire, being towed towards its final berth in Rotherhithe south east London in 1838 to be broken up for scrap. In 2005, The Fighting Temeraire was voted the greatest painting in a British art gallery. The painting gets some great screentime in SkyFall, so if you're looking for an art print of this painting for your collection, check out cards, posters and canvas prints in all shapes and sizes of The Figthing Temeraire on the National Gallery's website, Amazon.com or Amazon.co.uk. Q's remark is one of the many subtle references to the question if Bond should still exist, which we can interpret in our own world (should the Bond film franchise still exist) but also in the story of the film (is agent 007 still up to the task within MI6, and is MI6 itself still needed or capable in today's world?). 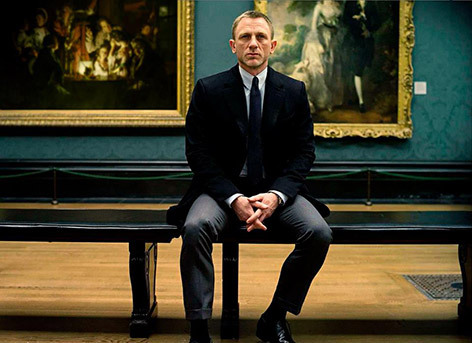 Other paintings in this scene are the two paintings we can see just behind Bond. 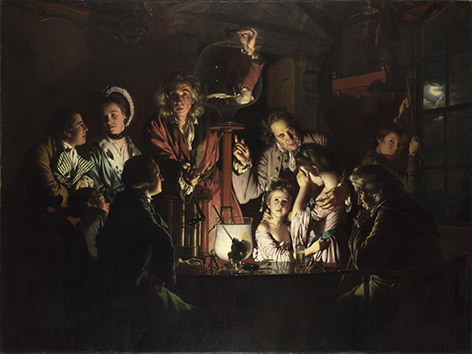 On the left side we can see Experiment on a Bird in the Air Pump, 1768, by Joseph Wright of Derby. The painting depicts a natural philosopher, a forerunner of the modern scientist (could this be a reference to Q? ), recreating one of Robert Boyle's air pump experiments, in which a bird is deprived of air, before a varied group of onlookers. 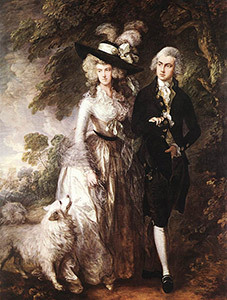 Next to that painting, we can see Thomas Gainsborough's The Morning Walk (1785), which shows an elegant young couple (William Hallett and Elizabeth Stephen) strolling through a woodland landscape, an attentive dog at the lady's heel. These paintings are part of the permanent display in the National Gallery. You can visit these paintings in Room 34 or check out the Virtual Tour of Room 34 to see the layout. In Shanghai, James Bond is the witness of a 'little drama', when a stolen painting is shown to a buyer who is subsequently killed by Patrice. 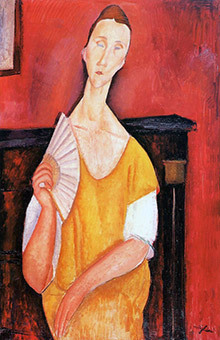 The painting is from Italian painter Amedeo Modigliani, and is called Woman with a Fan (1919). This painting was actually stolen from the Museum of Modern Art in Paris in May, 2010. Update 2015: this painting is once again seen in SPECTRE, in Madeleine Swann's room in Blofeld's lair in Morocco (read more). This painting is not only a nod to this real life fact, but it is also a reference to a similar 'inside joke' in the first James Bond film Dr. No (1962). 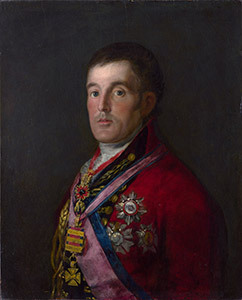 In Dr. No, we can see Francisco Goya's Portrait of The Duke of Wellington, which was stolen in 1961 from the National Gallery in London. The painting was retrieved and has been on display in the National Gallery ever since. Another artwork in SkyFall that clearly references to the issue of the relevance of MI6 and Bond, is the excerpt from the poem, read by M (Judi Dench) to the Minister during her hearing. The part read out loud is the last 5 lines of the poem Ulysses, by Lord Tennyson, written in 1842. M admits to dislike poetry, but these lines are very much in line with Old vs. New theme in the movie. SkyFall has proven that the real world James Bond franchise is clearly not ready to yield, but seems stronger than ever. Bond's reply to Q could also be interpreted simply - he sees what he sees. He is afterall as M called him "just a blunt instrument", perhaps he has yet to develop the more sophisticated side of the character. Has the painting in M's office in the final scene been identified? This is part of the James Hart Dyke 'A Year with MI6' collection, where James had access to the organisation. James also designed the DVD cover for Everything or Nothing. 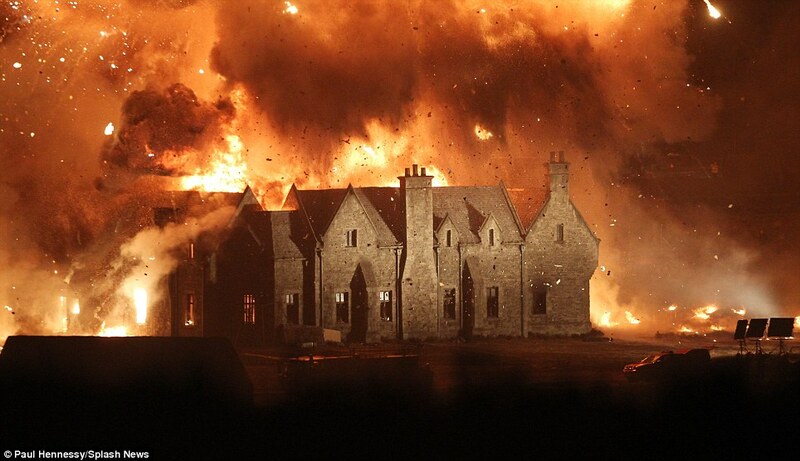 I watched Entrapment recently you will know part of the movie is set in Scotland in Sean Connery's characters castle. Catherine Zeta Jones expresses surprise that the paintings are contemporary and as the camera pans around one is seen. It is of a lady with a fan, Its the Modigliani in Skyfall and Spectre Coincidence? Or is here a hidden message? Eon killing off Sean perhaps?